The future of humankind is dependent on the ability to overcome one of the greatest challenges it is currently facing: sustainability. Whilst the challenge is clear, the path to a successful sustainable food system is not. One question is to what degree technological development can influence the food production chain. There is a large scientific community trying to put technology at work for sustainable agriculture, such as the recently launched Canadian Food System Design Project. This design project is trying to model food production in order to determine the best production potential of a certain area, taking into account ecological and economic constraints under various scenarios. But would that be enough to ensure sustainability of the booming urban populations in a continuously changing climate? 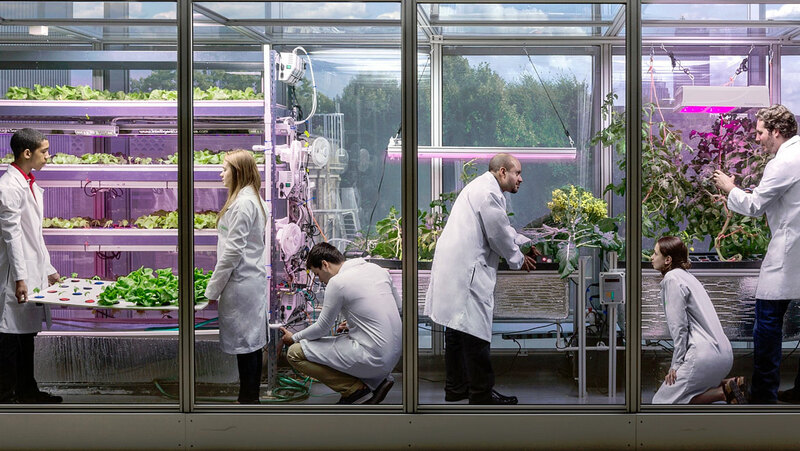 A technology oriented team at Massachusetts Institute of Technology (MIT) Media Lab believes the answer should consider recent technological breakthroughs, which enable new farming opportunities to take place indoors, and to take the digitally-managed farms, like Freight Farms, to the next level. The Open Agriculture Initiative (OpenAG) is on a mission to create more farmers for the future of food production. The team of researchers behind this new farming technology are working to implement open source hardware and software platforms for sensor-controlled hydroponic and aeroponic agriculture systems. Basically, the OpenAG is building collaborative tools and platforms to help develop an open-source ecosystem of food technologies that makes the science behind modern agriculture more accessible. They aim to do this by promoting transparency, networked experimentation, education, and local production. The OpenAG process begins with the production of controlled environment agriculture systems, the so-called personal food computers. The Food Computer is a controlled-environment agriculture technology platform that uses robotic systems to control and monitor climate, energy, and plant growth inside a specialized growing chamber. The plants are grown either with open-air roots or within a water surround and are fed with the necessary nutrients. The growing chamber’s sensors control many climatic variables such as carbon dioxide, air temperature, humidity, dissolved oxygen, potential hydrogen, electrical conductivity, and root-zone temperature. Operational energy, water, and mineral consumption are monitored (and adjusted) through electrical meters, flow sensors, and doses of minerals throughout the growth period. The system also keeps track of each specific set of conditions for a crop and allows for either improvement or reproduction of the exact same crop elsewhere in the world, as the recipes will be freely circulated amongst the Food Computer users. In the current OpenAG model, the Food Computers come in three sizes, which clearly link to the data-center design background. The Personal Food Computer is a tabletop-sized unit which is a small-scale environment mainly foreseen for experimentation and for learning about biology, botany, environment, programming, engineering, and more. The Food Server has the size of a standard shipping container and it is expected that these mid-sized units will appeal to interdisciplinary researchers and small-scale cafeterias, restaurants, and boutique operators. They will allow small scale producers to grow on-site and offer some of the freshest food options possible. The Food Data Center allows the control of environments within warehouse sized units capable of industrial production. These units will likely be subdivided in order to grow many different types of crops, all under their ideal growing conditions. Although to date the number of Food Computers is rather small, MIT is planning to build the first Food Data Center later this year. Furthermore, the increased efficiency of the last generation LED grow light technology (the major operating expenses of indoor farming), from 28% efficiency about five years ago to 68% today, ensures that vertical farming in general will be economically viable in the near future.